Pictured above are Hetter president & owner John Hetterscheidt (middle) and Hetter GM Mike Graessle (second from right) accepting the 2016 Torch Award from Kip Morse (second from left), president of the central Ohio chapter of the Better Business Bureau. 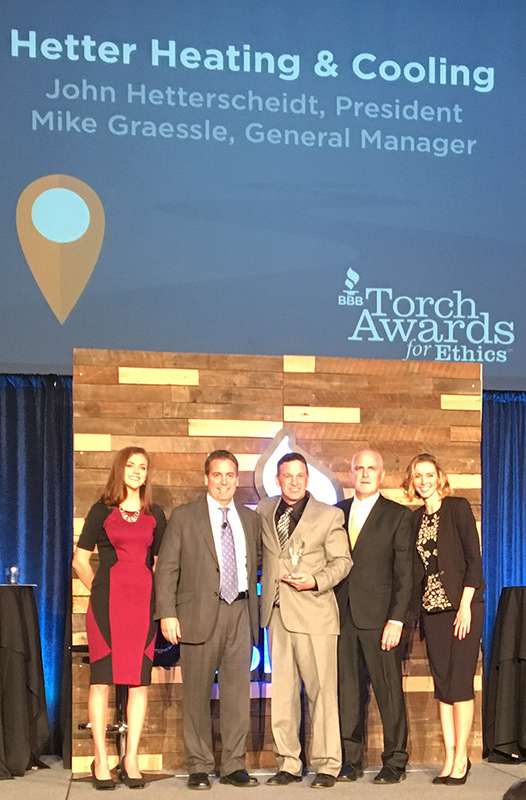 Hetter Heating & Cooling is so proud to have been selected for an unprecedented SECOND time as a recipient of the Torch Award for Ethics. 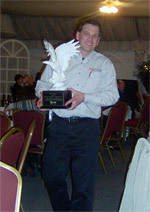 Hetter is one of only two companies to win the award twice, having done so for the first time in 2010. EE Ward Moving & Storage is the only other two time winner. The BBB launched the Torch Awards program in 1994 to recognize businesses who are intentionally pursuing the highest standards or organizational ethics. Hetter was one of only three companies to win the award in 2016 all of whom were featured in a 16-page story on in the November edition of Columbus CEO Magazine. Hetter won our first Torch Award in 2010 in – at that time – what was the most contested category for companies (50 employees or less). A panel of judges selected the winning organizations based on six ethical enterprising criteria and based on demonstrating a high level of trust among their employees, customers and their communities. 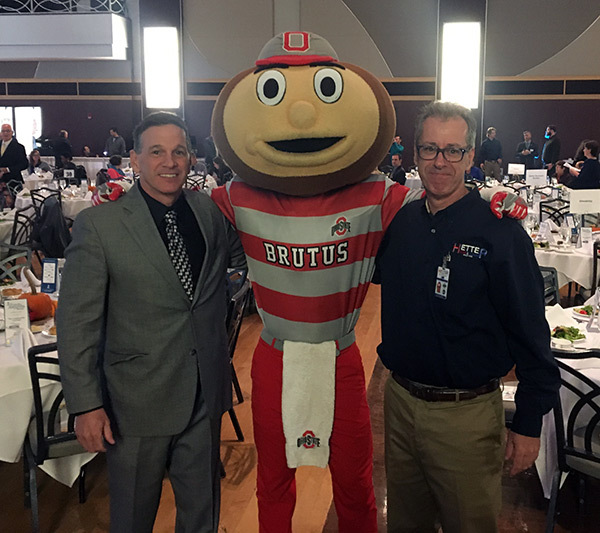 Pictured above are John Hetterscheidt (left) with Hetter sales rep & brother Rick Hetterscheidt (right) along with Brutus Buckeye at the 2016 Awards ceremony at the Ohio Union. BBB of central Ohio serves Columbus and 21 surrounding counties as a leader in advancing marketplace trust by encouraging best practices, celebrating role models, and denouncing substandard behavior. BBB sees trust as functions of respect, ethics, intent, delivering results and addressing concerns. Businesses and charities that earn BBB Accreditation have agreed to live up to our high standards and principals for trust. BBBs provide free and easily accessible Reliability Reports on businesses, Wise Giving Reports on charities, educational information, objective advice, and dispute resolution of marketplace complaints. The first BBB was founded in 1912, and today a network of 128 local BBBs serve communities across the U.S. and Canada, evaluating and monitoring more than 3 million businesses and charities. Visit www.bbb.org for more information. Hetter Heating & Cooling sets the bar for customer satisfaction numbers among all central Ohio Trane dealers for both service and installation. Hetter has maintained a 98% plus rating from customers surveyed by Trane who were either satisfied or very satisfied with our company’s installation and service. In 2015, Hetter was rated 99.5% for installation and a near perfect 99.8% for service by our customers. Hetter has maintained a 97% plus rating from customers surveyed by Trane over the last couple of years who were either satisfied or very satisfied with our company’s installation and service. Hetter Heating & Cooling is proud to maintain an A+ rating with the Better Business Bureau. We have also received the Angie’s List Super Service Award sixteen years in a row.